Acton Green is a small neighbourhood in the London Borough of Ealing, in west London, England. It is named for Acton Green common, a park at the bordering Chiswick district. 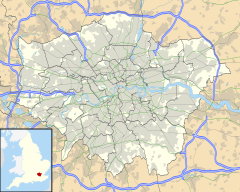 South Acton is the nearest National Rail station and is on the North London Line while Chiswick railway station is the closest for services into London Waterloo. Acton has seven railway stations, namely North, East, South, West, Central, Mainline and Town. Four of these are on the London Underground and three on national rail. Acton is the only town in London to have all four of the points of the compass as stations. This page was last edited on 16 November 2018, at 23:38 (UTC).